Nothing had come easy to the New York Mets lately, until San Diego rookie Ryan Schimpf gave them a gift. 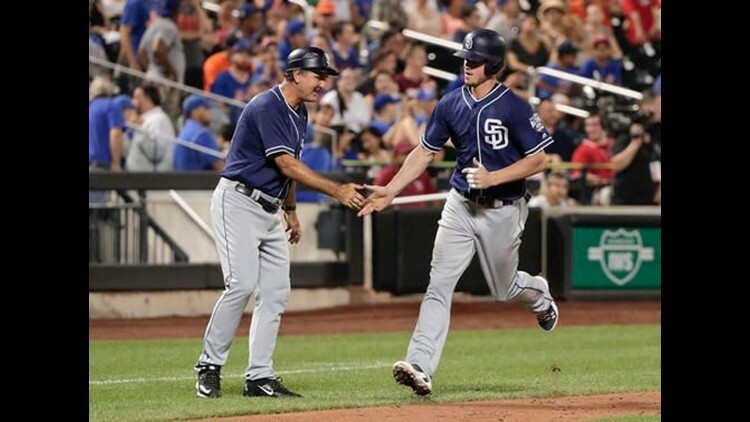 NEW YORK (AP) — Nothing had come easy to the New York Mets lately, until San Diego rookie Ryan Schimpf gave them a gift. Wilmer Flores drove in the winning run when Schimpf made a wild throw home in the 11th inning, and the Mets brushed off two stunning homers in beating the Padres 3-2 on Saturday night to stop a four-game slide. "We're just hoping this turns the tide," manager Terry Collins said. "Hopefully this is the start of something." Just called up from the minors, Gabriel Ynoa (1-0) pitched a perfect inning to win his major league debut after Jacob deGrom gave the Mets another dominant start. Flores finished with three hits, and the defending NL champions (58-58) won for only the fourth time in their last 17 home games. Yangervis Solarte and Wil Myers each hit a tying homer for the Padres. Myers connected off All-Star closer Jeurys Familia with two outs in the ninth, delaying the postgame concert by Styx. "There's nothing more clutch than that," San Diego manager Andy Green said. Neil Walker singled against Brandon Maurer (0-3) leading off the 11th and alertly hustled to third with one out on James Loney's soft single to shallow left field as the Padres, caught in a defensive shift, scrambled to cover the bag. With the infield playing halfway, Flores hit a grounder over the mound that was fielded in front of second base by Schimpf. Rather than try for an inning-ending double play, the second baseman fired home and his throw sailed well wide as Walker slid in safely. New York had lost its previous seven one-run games. "I thought he was going to turn two," Flores said. "That's one of the things about putting the ball in play — anything can happen." Schimpf, who homered twice and set a Padres rookie record with six RBIs in the series opener Friday night, bent over and put his head between his knees. "I let us down tonight," he said. "I made the wrong decision." Familia retired his first two batters and was two strikes from closing it out when Myers drove a 97 mph sinker to left-center. His 23rd homer drew groans from a crowd of 36,854 on the first Pride Night at Citi Field. The major league leader with 39 saves, Familia has blown three of his past six chances after converting 52 straight regular-season opportunities dating to last year — the third-longest streak in baseball history. He hadn't allowed a home run in the regular season since Freddie Freeman connected for Atlanta last Sept. 23. Still, restless Mets fans booed Familia when the inning ended. "This game is not easy right now," Walker said. "We're grinding away and this is what it's all about." Solarte also jolted New York when his two-out homer in the seventh tied it at 1. Before that, deGrom was rolling along in sweltering humidity on a 91-degree night. He had faced the minimum and given up only one hit, a single by Schimpf in the fifth. In seven stellar innings, the right-hander struck out nine and permitted just three hits. "Terrific performance," Collins said. "Especially in that kind of weather, to go out, pitch like that, it was pretty impressive." Just off the disabled list, Jose Reyes provided an immediate spark for the slumping Mets. He drew a leadoff walk, dashed to second on a wild pitch and continued to third when catcher Christian Bethancourt threw high into center field for an error. Reyes scored on Walker's single. A sacrifice fly by pinch-hitter Kelly Johnson put New York ahead 2-1 in the seventh. Jarred Cosart had by far his best outing for the Padres in his third start since they acquired him from Miami on July 29. The right-hander yielded one run and three hits in six innings but is still looking for his first major league win since Sept. 17, 2015. In nine no-decisions this season, deGrom has a 1.92 ERA. Six times he has allowed no more than one run and failed to get a win. Familia has squandered three ninth-inning leads for deGrom, who has held the opposition to one run or fewer in each of his past four starts (0.65 ERA) and owns a 1.56 ERA since the All-Star break. Padres: RHP Brandon Morrow was called up from Triple-A El Paso and pitched a perfect eighth inning, his first major league outing since May 2, 2015. He was sidelined by a shoulder injury last year that eventually required surgery. Mets: In the third inning, Reyes fouled a ball off the plate that bounced up and hit him in the face. He went into a crouch and was checked by Collins and a trainer, but stayed in the game. Padres: LHP Clayton Richard (0-1, 6.46 ERA) likely will be limited to about 75 pitches when he starts the series finale Sunday as San Diego goes to a six-man rotation during a stretch of 16 games between off days. It will be Richard's third outing and first start for the Padres this season. Mets: Rookie LHP Steven Matz (8-8, 3.60) faces the Padres for the first time. He is 1-7 in his past 13 starts.